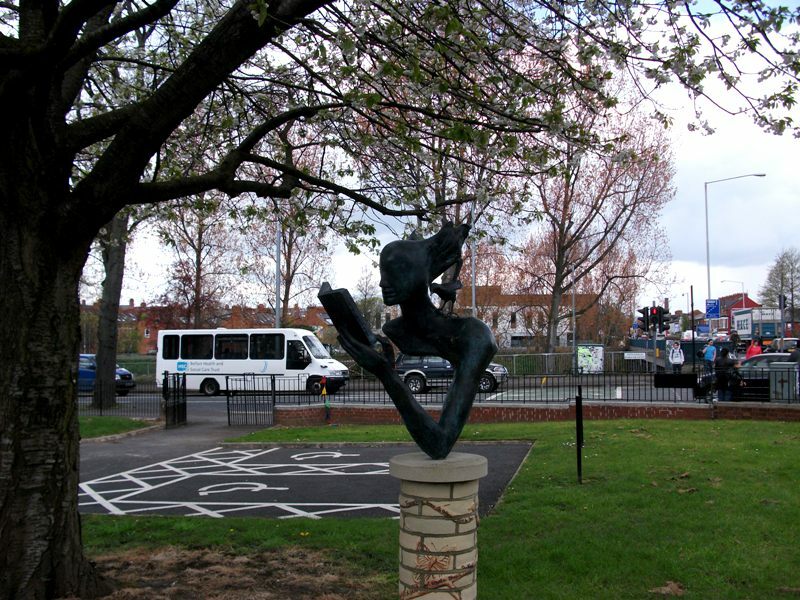 This sculpture depicting a girl and blackbird reading a book is outside the library on the Ormeau Road, Belfast. It was inspired by Seamus Heaney’s poem “The Blackbird of Belfast Lough” which, I believe, has been based on the ninth century poem above, translated by Seamus. Unfortunately I was unable to find any information about the sculptor of this piece. This entry was posted in Ireland, Photography, Sculpture on September 9, 2012 by Grannymar. It’s a good thing you mentioned the black bird, because I would have missed it. I’m glad I clicked on the picture to get a larger view. 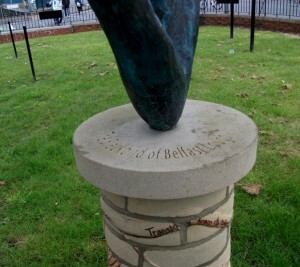 Lovely sculpture and poem! I would have missed the bird too, had I not enlarged the pic. With the tree and the buildings all around it was difficult to get a clear picture. I was also trying to keep up with a Toyboy! I wonder if Paul remembers that day? That poetry would flummox me. What’s a nib or a neb? Maria G – Was it not the yellow beak? I like it best in Irish. I love listening to it (the language) even though I have no idea what is being said. Such a soft and beautiful language. Tilly – I know a few wonderful native Irish speakers and love to listen to them even though I struggle with the language myself. I do indeed remember that day. I think we were (well I was anyway) beginning to tire by then – though we still had to walk along the river and up the hill. BWT – I think you dragged me up the hill! It was a good day with nice memories. 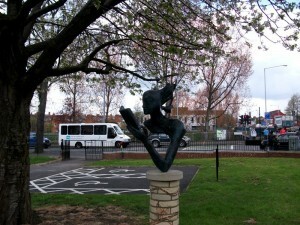 This is a lovely sculpture, best photographed early on a spring morning when the Apple blossom is in bloom. I was unaware that it related to the ancient Gaelic poem. My favourite translation is ‘What little throat has framed that note, and cast it across the bay?